WASHINGTON (AP) — Back in January, the Democrats welcomed their brash young newcomers to Congress with smiles and hugs. That was before the new colleagues dragged the party’s simmering divisions over Israel out in the open. Provocative comments from Rep. Ilhan Omar of Minnesota have thrust the Democrats into an uncomfortable debate over Israel policy a few weeks before a high-profile conference where senior Democrats typically make a show of support for the Jewish state. Increasingly, the rift appears as much generational as ideological, with newly elected Democrats showing less deference to the party line. Omar became the flash point after she suggested last week that Israel’s supporters are pushing U.S. lawmakers to take a pledge of “allegiance to a foreign country.” It’s at least the third time she has forced older, pro-Israel Democrats who run the House into awkward territory over U.S.-Israeli policy. Republicans have been happy to stoke the furor, with President Donald Trump calling Omar’s remarks “a dark day for Israel” and posting a photo of himself in Jerusalem. Inside the Democratic family, meanwhile, leaders are in a bind, torn between a need to admonish Omar for her comments and their desire to defend one of the first Muslim women elected to Congress. This time Omar is not apologizing. And this time pro-Israel Democrats led by Speaker Nancy Pelosi are not just warning her about the dangers of Jewish tropes. They’re expected to offer a resolution condemning anti-Semitism on the House floor. Pelosi and Majority Leader Steny Hoyer announced in a meeting of leading Democrats late Tuesday that the text will be updated to include anti-Muslim bias, according to a senior Democratic aide who spoke on condition of anonymity to discuss the private meeting. Other Democrats said an outpouring of support for Omar prompted leaders to consider broadening the measure to avoid dissension. Omar did not speak to reporters outside her office on Tuesday evening. The text, which includes a history of bigotry against Muslims and blacks as well as Jews, sounds unobjectionable by itself. But the fact that senior Democrats felt obliged to put the House on-record on the topic points to a transformation in the country — mostly among Democrats — about supporting the Jewish state. In a poll by the Pew Research Center in January of last year, 46 percent of Americans said they sympathized more with Israel and 16 percent with the Palestinians in their Middle East discord. But Democrats are about evenly divided, with about a quarter sympathizing with each side and the rest saying they side with neither or don’t know — and in recent years they have become less likely to sympathize with Israel than they were in the past. Liberal Democrats were nearly twice as likely to say they sympathize more with the Palestinians (35 percent) than with Israel (19 percent). Older Americans were much more likely to say they sympathize with Israel than with the Palestinians, with more division among younger Americans. Omar, a Somali-American, says that what she is questioning is the influence game in Washington and she worries that anything she says about Israel and its treatment of Palestinians will be construed as anti-Semitic. But Democrats in Congress remain largely supportive of Israel. Pelosi, for example, often attends the American Israel Public Affairs Committee conference in Washington, which is coming up later this month. Omar on Tuesday got a boost from allies who point out that the congresswoman, too, has been the target of threats and bigotry. Rep. Alexandria Ocasio-Cortez suggested in a tweet that her fellow freshman was being treated unfairly. “No one seeks this level of reprimand when members make statements about Latinx + other communities,” the New York Democrat wrote. But there also was talk of finding a candidate to challenge her in 2020. Senior Democrats were standing firmly against Omar’s comments, and not for the first time. Earlier this year, she apologized for a 2012 tweet in which she said Israel had “hypnotized” America. And last month, she apologized for suggesting that members of Congress support Israel because they are paid to do so. That earned her stern rebukes from Pelosi and House Foreign Relations Committee Chairman Eliot Engel, among others. 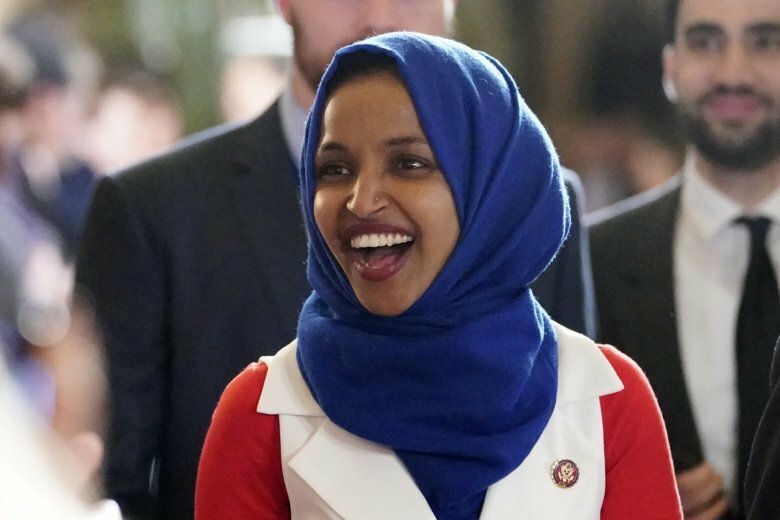 This time, Engel declared that Omar’s suggestion about divided loyalties was a “vile” stereotype that had no place on his committee. Republicans, meanwhile, demanded that Democrats throw Omar off Engel’s panel. There was no sign of that happening at midday Tuesday. “I should not be expected to have allegiance/pledge support to a foreign country in order to serve my country in Congress or serve on committee,” Omar tweeted. Michigan Rep. Debbie Dingell said Engel, while upset with Omar’s comments, “feels that she brings a different perspective to the committee” that keeps it strong. Associated Press writers Doug Glass in Minneapolis and Emily Swanson and Hannah Fingerhut in Washington contributed to this report.